It's nice to see Samsung keeping most of the high-end features in this little guy but for around €700, some corners had to be cut. For starters, you don't get the telephoto lens, the bezels are a tad thicker and the under-display fingerprint has moved to the side frame. If you are willing to live without those, than the Galaxy S10e might be the right choice for you out of all three phones Galaxy S10s. Body: 142.2 x 69.9 x 7.9 mm, 150 grams, metal side frame, Gorilla Glass 5 on the front and back. Screen: 5.8" Dynamic AMOLED, 1080 x 2280px resolution; 19:9 aspect ratio; ~438 ppi. Chipset: Exynos 9820 Octa (8nm) chipset: octa-core CPU ((2x2.73 GHz Mongoose M4 & 2x2.31 GHz Cortex-A75 & 4x1.95 GHz Cortex-A55); Mali-G76 MP12 GPU. Memory: 6GB RAM, 128GB built-in storage, microSD slot support. OS: One UI based on Android 9.0 Pie. Rear camera: 12MP f/1.5-2.4, 1.4µm, 1/2.55", PDAF support, OIS + 16MP f/2.2, ultra-wide 104µm, LED flash; 1080p@30/60/240fps, 4K@30/60fps, 720p@960fps, HDR10+ support. Front camera: 10MP f/1.9, up to 2160p@30fps video recording. Battery: 3,100mAh, adaptive fast charging 15W (9V/1.67A). Connectivity: Single-SIM, Dual-SIM available in certain markets (hybrid slot); LTE-A, 7-Band carrier aggregation, Cat.20/13 (2Gbps/150Mbps); USB Type-C (v3.1); Wi-Fi a/b/g/n/ac/ax MU-MIMO; GPS, GLONASS, Beidou, Galileo; NFC; Bluetooth 5.0. Misc: Stereo loudspeakers, wireless charging, reverse wireless charging, IP68 rating dust and water protection. 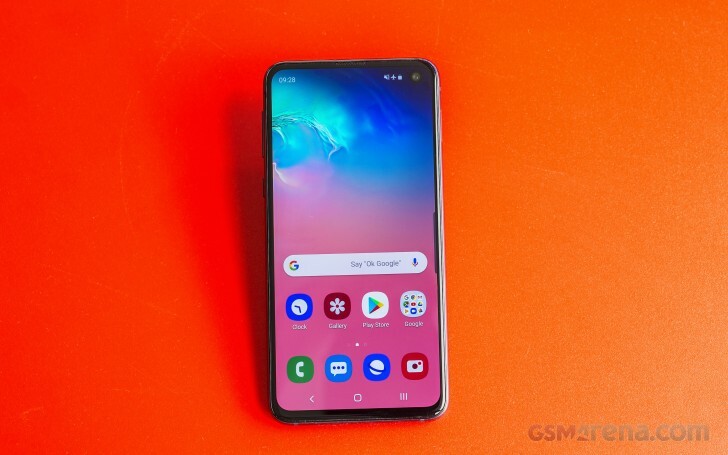 But don't mistake the Galaxy S10e for an upper-mid-range device. 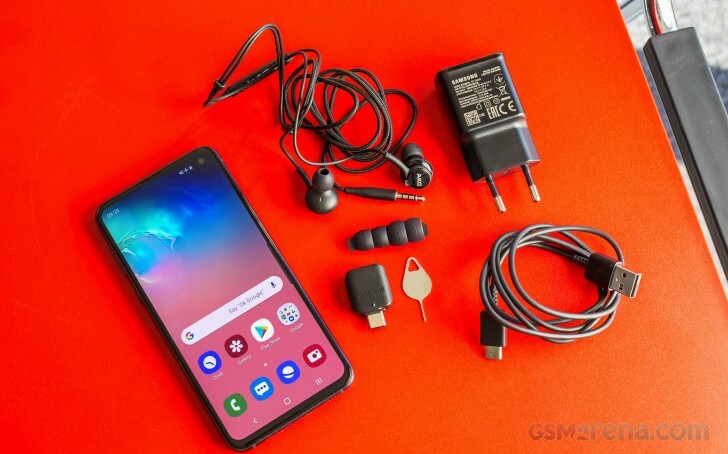 It's still a flagship phone with a corresponding price tag although, a lot lower than the S10 or S10+ for that matter. You still get the flawless screen experience - as long as you don't mind the punch-hole camera - the great camera, powerful Exynos 9820 (or the Snapdragon 855 depending on your region) and tons of proprietary Samsung features. Unfortunately, we didn't get a retail unit so the phone didn't come in its original box. However, we did receive the proper charger supporting fast charging output of 15W. We also got the AKG-branded buds, which sound great, by the way. It seems that all three Galaxies come with those AKGs. Kudos for that. I play a lot of online video games like FINAL FANTASY BRAVE EXVIUS , AND MADDEN OVERDRIVE ON MY S10e. I only get 5 hours of battery life out of it, whether I play games for 5 hours, or leave it in my pocket the entire time. Can I ask you what is your specific way of useing yours10e so you can achieve such great SOT results? Thanks in advance. Thank you so much for your detailed review. I really appreciate it. I am glad there is someone who really understands what to look for when it comes to tech specs and user experience.